Cut pork hocks are a perfect treat for small to medium dogs. 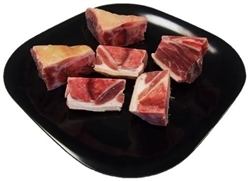 Pork hocks consist of mostly bone with a little bit of meat left on the bone. Pork hocks are a great source of bone marrow.